Monterey Peninsula Quilters Guild or MPQG was founded in 1979 by Jeanne Mills and Wendy Howe, who dreamed of having a quilting guild on the Monterey Peninsula. They gathered together a small group of quilters and shared ideas for forming a guild, which would offer workshops, lectures, and a quilt show for its members and the community. With enthusiasm and support, the women divided the responsibilities and invited every interested quilter to come to the first meeting. From that small group of enthusiastic quilters, we have grown to be an organization of nearly 200 members. Our Purpose is to preserve the heritage of beauty, diligence and love embodied in those quilts which have been handed down to us; to acknowledge and encourage a concern for excellence of design and craftsmanship as we perpetuate this American folk art; to become a source of information, education, and inspiration; and to further the personal reward of companionship among quilters sharing a common interest. Funds come from membership dues, quilt show revenues, raffle ticket sales, workshop fees, donations, door prizes, advertising revenue, etc. Member Participation is the means by which MPQG operates. Our volunteer organization relies on its members to be active participants in its many activities. One can be a committee member, a committee chair or a board member. The biennial quilt show is a success because all members participate. MPQG wants and needs everyone’s special skills and talents. The Guild's Articles of Incorporation were filed in 1994 providing a tax-exempt status for educational and charitable purposes under Section 501 (c) (3) of the Internal Revenue Code. I’ve been asked to write a bit about the history of the guild. I recalled this early photo of members who gathered for some early morning picture taking. The photo, taken by Sharon Risedorph, who has given me permission to reprint it, appeared in the 1984 edition of The Quilt Digest, by Roderick Kiracofe and Michael Kile. 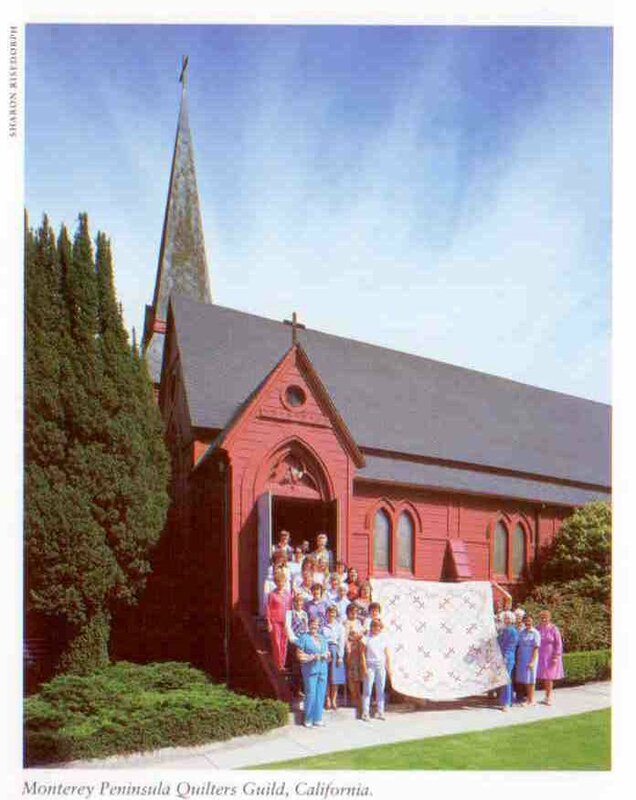 Standing on the steps of St. Mary’s-by-the-Sea Episcopal Church on 12th St in Pacific Grove, we’re proudly holding up an early quilt. It’s impossible to distinguish the faces, but if you are in the photo, you know where you are standing. Guild and early members have aged well. As you know the guild was founded in 1979 and for many years we met for meetings and workshops in St. Mary’s Episcopal Church Parish Hall. I believe we always met on the 1st Monday of the month and, as more members were available for evening meetings, we soon chose early evenings as the meeting time. When we moved to a new venue in the mid-90’s there was a sigh of relief as we no longer had to set up and put away chairs and tables and vacuum the carpet before closing the doors. We’ve had many quilt shows and made many raffle quilts, listened to and taken workshops from countless nationally and internationally known speakers and teachers, all the usual guild activities. We’ve always been known for hiring top-notch speakers for our programs and it remains one of our purposes. Early on, we held an unusual meeting, as a way of having fun and promoting an upcoming Quilt Show. In August 1981, members gathered in my yard, in prairie style dress, bringing with them quilt frames, several quilting hoops, lots of handwork, and food for a potluck lunch. We invited the Monterey Herald to come to our quilting bee. Needless to say the spread of food was delicious and the spread in the newspaper was fantastic. The purposes of the MPQG are to preserve the heritage of the beauty, diligence and love embodied in those quilts that have been handed down to us; to acknowledge and encourage a concern for excellence of design and craftsmanship as we perpetuate this American Folk Art; to become a source of information, education and inspiration; to further the personal rewards of companionship among quilters sharing a common interest. In 1994, Monterey Peninsula Quilters Guild’s articles of incorporation for educational and charitable purposes, giving us a tax exempt status under Section 501 (C) (3) of the Internal Revenue Code, were filed.